One of the best ways to get more exposure and more traffic to your blog posts is via Social Networking Websites. Social Networking Websites can easily boost your traffic. Users will easily share your posts on Social sites like Facebook, Digg, Twitter and StumbleUpon if you add social media buttons to your blog posts. These days most of the bloggers are adding floating social media buttons to their blog posts. Floating buttons stay on a fixed position even if you scroll down or up the page which gives your blog readers the more flexibility to easily share your posts. 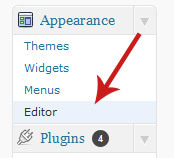 In this tutorial you will learn How to add these floating icons to your WordPress blog. Sign in to your Dashboard and go to Appearance -> Editor. Copy and paste the following code in style.css file. Now open single.php file and search for something like <div class=”entry”> and paste the following code after it. Now open any of your blog post and see the new floating social media buttons. If you face any problem in adding these buttons to your blog, just leave your comment here and I’ll be available to help you out. Ho. Thanks for this article mate. I have searched for a working code madly. And now i am here and your code is working. I have done some editing to your code. Hope you dont mind it. Glad you like the article mate. I don’t mind if you change the code. You can change it according to your requirements and you taste. I think you didn’t use the code yet. Digg button is already added into this code. Hey please update the code in third last row. Actually the code got executed while updating this post. I tried to put the Adsense ads with this code and its working fine for me. Put the Adsense code above or below my code and it will work. If you couldn’t find the changes then copy the whole code again and paste it in your blog. Althought your instructions are nice, it would of been better to add the code into one’s functions file. It’s safer to do it that way as if you ever get a new theme, you just have top copy your functions file and not try and remember where all you made changes to what files, etc. Thanks for your suggestion George but I don’t think that we can use the same functions file in every WordPress theme. Some themes offer theme functions and some don’t. All the coding for theme functions is saved in functions.php file so I don’t think that we can use the same file everywhere. Thanks Simran. I was looking for this. I just removed the floating buttons from my site because one of my readers complained that it was blocking the content. Apparently on monitors with Lower resolutions, it blocks the content :-(. I totally agree with you Udegbunam. Floating buttons don’t do well on lower resolution monitors. They look great only if you have wide-screen monitor. i had digg digg plugin as i haven’t seen the post before…… otherwise used your code.. well thanx for sharing mate……. Most of the bloggers are using digg digg plugin.. You should use this code on your blog. Any specfic reason for using plugins over manual coding ? Very nice detailed article. Plugins should be avoided as they put a lot of load on the server. I’m pretty phonic of coding… largely because I have the technical capabilities of a goldfish! That’s why I use plugins for pretty much everything but I might actually be tempted to try this out. Smart sharing plugin is really nice if you don’t want to manually add the code. You got it right Rajeel. This tutorial is specially for those who are using digg digg plugin. Using a plugin slows down the page load speed, so this tutorial may be helpful for bloggers. thank you very much for this tutorial. How to add the bar also for the posts in homepage, and not only single posts? If you want to show the buttons on homepage too then copy and paste the code in index.php file also. But the buttons will then link to homepage only. Works good for me on firefox (stays on the down left part of the screen as one scrolls down). But on IE, it is seen in a box above the comments section. I have added the Floating Social Media Buttons to my blog, but I having some problem on the placement. It appear on the top of all post, when it suppose to appear by the side. I use the blog URL for this post, you can see what I mean when you open any of the post on the blog. The buttons are on the left side if the post in my monitor. What is the resolution of your monitor ? The floating icon just seat on top of all my post. It is on the lift side, but just seat on the post. I think it suppose to be on the outside lift, so that it can move as we scroll the page up and down, it is not in my case. its not working……. r u sure this process or its my error?? Thanks for the excellent tutorial. Works perfectly. Is there a way to add a facebook share count like on the twitter share button? This is great! I’ve always wanted to add something like this. Hay there is error in script.. but working…..
Oh, this floating thingy looks cool, and can be done without a plugin! That’s awesome. This was very helpful. Thank you. Just one thing. The buttons are appearing vertically. Any idea how to make them horizontal in order to save space? i m using Lifestyle template in my wp blog. but i couldn’t find any single.php file. thnx for sharing..but a facebook share button is must.. Cool plugin. Thanks a lot for share.